Looking for reasons for the slowdown in the Indian economy? The International Monetary Fund’s latest edition of its flagship publication -- World Economic Outlook -- provides us an important clue. It says falling commodity and crude oil prices provided an opportunity for the Indian economy in 2015 and 2016. These windfall gains amounted to a cumulative 4.3 percent of GDP in the two years. In 2017 and 2018, though, commodity and crude oil prices edged higher, resulting in a cumulative drag of 2.3 percent of GDP on India’s growth. 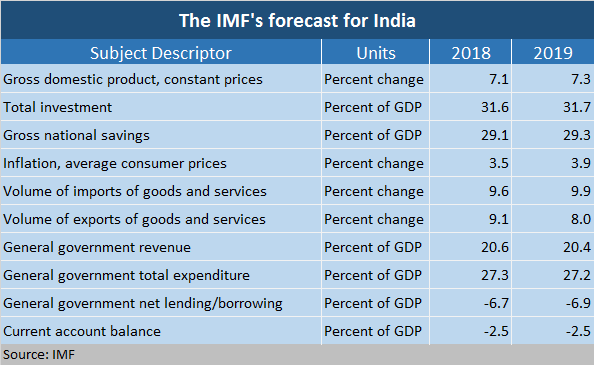 The forecast for 2019 and 2020: happy days are back, crude prices will weaken and India’s windfall gain will be an average of 0.34 percent of GDP for these years. And guess what -- India’s GDP growth went up in 2015 and 2016, fell in 2017 and 2018 and is projected to be higher again in 2019 and 2020.